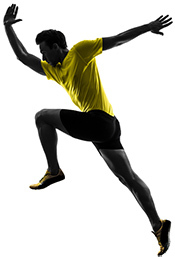 BioAnkle®, is our program of biologic treatments to rebuild injured and arthritic ankles. It starts with careful physical therapy to increase range of motion and optimize gait for people who have primarily soft tissue injuries to the ankle. Where indicated, physical examination and review of X-Rays and MRIs are performed to help assess the source of pain and which treatments may be indicated to help regain function and reduce pain. Listed below are surgical treatments that comprise our BioAnkle® program. Debridement of built-up scar tissue followed by rebuilding of the unstable ligaments usually provides for excellent stability of the ankle when combined with a guided early exercise program focusing on range of motion, balance, stability, and strength training. When there's a rupture of soft tissue such as the Achilles tendon, our percutaneous suture repair technique has shown to be effective over the last 25 years at repairing the ruptured Achilles tendon and returning the patient back to sports. Our long term data with MRI follow-up of torn Achilles tendons demonstrates that the tendons heal with a normal appearance on MRI although slightly thicker than the normal Achilles tendon. A patient 2 years from percutaneous Achilles tendon repair surgery. 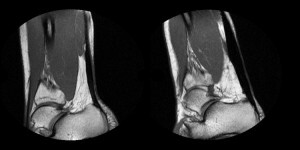 The thicker repaired tendon can be seen on the left, with the thinner native tendon on the right. A patient 9 years from percutaneous Achilles tendon repair surgery. 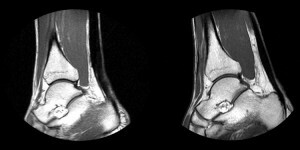 The thicker repaired tendon can be seen on the right, with the thinner native tendon on the left. A patient 16 years from percutaneous Achilles tendon repair surgery. 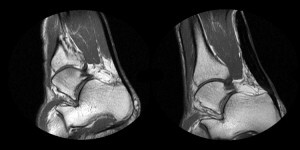 The thicker repaired tendon can be seen on the right, with the thinner native tendon on the left. We rarely have to open a ruptured Achilles tendon unless it's a complete re-rupture requiring revision reconstruction using allograft tissue. Almost all primary Achilles tendons are repairable percutaneously. Articular cartilage injuries such as an OCD lesion of the talus or arthritic changes in the ankle, can be treated by grafting the damaged articular cartilage using our articular cartilage paste graft technique. The technique involves harvest of articular cartilage and underlying bone from the anterior lip of the distal tibia although sometimes augmented by additional tibial bone, morselizing the damaged articular cartilage or OCD lesion and then packing the graft into the defect. This procedure is followed by four weeks of non-weight-bearing with CPM motion and then four to six months of careful rehabilitation strengthening balance and coordination program focusing on soft tissue mobilization to return to full range of motion. Damaged articular cartilage in the ankle can be successfully regenerated to form a superb repair tissue that can last decades. Extensive arthrosis with eburnated bone on the distal tibia and talus may require ankle replacement or fusion. However, these are considered last steps after all BioAnkle® treatments have been exhausted.